The power of live cell imaging would be enhanced by reporter constructs, once a transformation system has been determined. A promising genetic system is the expression of the intracellular serine proteinase (Watkinson et al., 2001) which has already been cloned. Patterns of pulsation may have a role in network coordination (Tlalka et al., 2003, 2007; Fricker et al., 2007). The expression of genes for specific metabolic steps, combined with analysis of pulse pattern, may help to illuminate the processes that underlie signal reception, propagation and response. The mechanism of pulsation is not understood. Pulsation was most marked in translocating cords (Bebber et al., 2007), and did not necessarily accompany rhythmic hyphal growth. 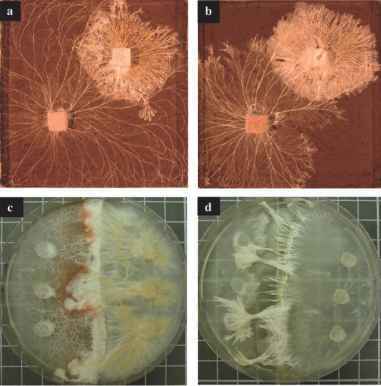 S. lacrymans was not among the species with pronounced pulsation in transport, despite the rhythmic growth evident in Figure 4, where two successive waves of denser growth appeared to have occurred during the experiment.